A leisurely stroll from the designer boutiques and culinary delights of Camden, our stunning new salon and spa is located in the beautifully tree line John Street, Camden. About Face salon and spa offers all of your hair and beauty needs in one convenient location. Our day spa boasts 7 purpose built treatment rooms, including a couples treatment suite, our Luxe Spa retreat with private steam shower, bronzed tanning temple, stunning manicure and pedicure stations and paramedical rooms. Our culture within the walls of our hair salon, is a very special place. It is here that we are nurturing a vibrant, creative community, where the many talents of a select few fuse together to form a hybrid talent which is greater than any of its single components. This talent evolves constantly by means of our endeavours. Our salon includes 8 luxury hair stations, 2 barber stations, makeup area, and a private VIP hair suite. About Face specialise in salon and spa treatments for woman, men, couples and signature spa therapies. 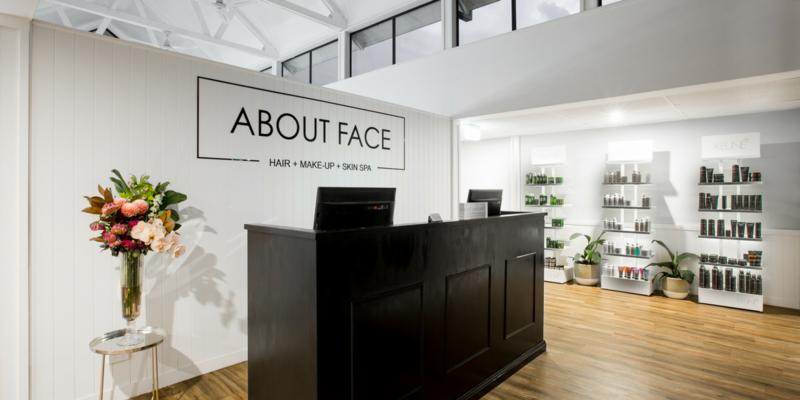 In addition to our decadent menu of creative and soul pleasing treatments, About Face boasts a retail boutique offering an extensive range of professional skincare and hair products, unique spa gifts and heavenly candle selections.